By submitting this form, we will take no action to protect your interests. Submission of this form does not establish an attorney-client privilege. Despite public education and strict laws against drunk driving, there were 6,757 drunk driving wrecks in Arizona in 2008, according to the Arizona Department of Transportation. At Bache & Lynch , we have worked with many families whose lives have been forever changed by drunk driving. Our attorneys meticulously examine all of the facts and circumstances surrounding every incident, including the actions of the responsible driver and factors such as the road conditions and whether the driver was served alcohol when he or she was visibly intoxicated. We use every legal and negotiation skill at our disposal to obtain justice as well as financial compensation after serious drunk driving accidents. Drunk drivers put all of us at risk, including our families and loved ones. Drunk driving must be stopped. Our job as drunk driving accident attorneys is to make sure that those responsible pay the consequences, and that their victims are compensated to the fullest extent permitted by law. If you were seriously hurt or a family member was killed in a fatal accident, contact our law firm for an immediate and confidential consultation about your legal rights. Our lawyers can help you or your family get the financial compensation to which you are entitled. DUI and DWI accidents that cause serious personal injury or wrongful death will be prosecuted in Arizona’s criminal courts, where drivers face possible fines, driver’s license suspension and jail time. Drunk drivers must also answer for their actions in civil court or through insurance claims against them. These civil claims are where we come in. Insurance claims involving drunk driving accidents are different from other types of motor vehicle accidents because the injury victims or surviving families may be entitled to punitive damages in addition to compensation for the economic, personal, and other losses suffered. The purpose of punitive damages is punishment, to hurt drunk drivers financially to enforce the seriousness of their actions. Punitive damages are available in drunk driving accidents because drunk driving is more than a mistake. It’s close to an intentional act like assault because a person who has had too much to drink and who gets behind the wheel of a car knows there’s a good chance of an accident. Depending upon the circumstances, punitive damages may far exceed the financial damages suffered in an accident. Because of this possibility, we must carefully examine all of the factors regarding the accident, such as whether the driver had a history of driving drunk. Drunk driving victims and their families also need advocacy in the criminal proceedings against the drunk driver who caused the accident. One of our two experienced attorneys has a background in criminal law, which helps us explain the criminal process to our personal injury clients more clearly and plainly. When we represent drunk driving accident victims in civil claims, we also represent their interests in the criminal proceedings. We present the victims’ view of events to the prosecuting attorneys and help prepare victims to testify at trials about the accidents’ effects on their lives and families. Our firm only represents victims of drunk driving and never represents drunk drivers. Under Arizona law, drunk driving victims have the right to seek compensation through the criminal process for any costs associated with the accident that are not covered by insurance. This is called restitution. Through both the civil litigation to recover damages and the criminal process and restitution, we are with drunk driving accident victims and their families every step of the way to see that justice is done and that they are compensated to the maximum extent permitted by law. Drunk driving cases are serious — often resulting in life-changing injury such as brain injury, spinal cord injury or wrongful death. 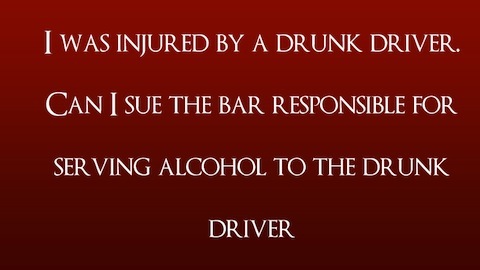 Each case deserves serious attention from knowledgeable drunk driving accident lawyers. At Bache & Lynch, our attorneys have over 50 years of combined legal experience in personal injury. We know how to get compensation for those injured from those responsible for causing the injury. To schedule a free and private consultation, call 520-293-5300, or contact us using the Contact Form above. We will meet with you and provide a free evaluation of your case. You’ll be able to meet our entire team that will represent your interests and be there with your every step of the way.